I was recently in Hong Kong, one of the world’s most vibrant cities, with its amazing skyline, a myriad of interesting restaurants, great shopping, and exciting night life. So, what did I do there? I looked up the nearest high-end shops near my motel and hopped a cab to take a look – something an authentic audiophile would do! I was directed to a busy shopping district, where high rise downtown stores presented endless opportunities for diminutive audio salons to hide. After struggling through a sea of humanity at a five-story Best Buy store, I discovered the shopping mall contained clusters of HiFi shops arranged in a ring similar to the way fast food restaurants occupy a level of a mall. I was surprised at how cramped the small audio stores were; in some instances, utilization of floor space demanded that racks of equipment stood literally between the system I was hearing and the listening chair! The best store I encountered carried fine lines such as Naim, Cambridge Audio, Oracle, and for speakers proudly presented the Tannoy line to the level of the Sandringham SE, fed by a Cyrus cdp and Accuphase power. It was a delightful experience as I had not had an earful of soothing music for almost two weeks, a virtual eternity for an audio addict. It was a panacea for the ears, as I had been putting up with a tour bus drone and the incessant horns and thrumming of small motorcycles. I was not in a critical listening mode, but a relaxed “absorption” mode, like the way one relaxes when entering a spa to soak. It was quite the interesting moment as several curious shoppers, lured by the sound into the listening room, spoke loudly over the music, seemingly oblivious to the fact that someone was attempting to listen. They wandered to the front and around the room, at times making exclamations to each other at some piece of equipment. I surmised that this is normal in Hong Kong where there are so many people, that one is expected to suffer intrusion no matter what the activity as long as the door is not closed (and under certain circumstances even if the door is barred!). Even though all I could master of Chinese was “Nee How (Hello)” and “She-Ah-She (Thank you)”, I found it relatively easy to connect on audio via reference to equipment names. I thought I would test the appeal of the Tannoy products by writing down my equipment at home (many Chinese can understand printed English words better than spoken – they can’t understand our pronunciation of the words but mentally reformulate them when they see them written). Pointing at the manufacturer’s brochure, I indicated that I was using the Tannoy Glenair, which elicited a huge grin and, “Oooooh!” from the shop manager. (I assume) He quickly told the other customers that the well-off American used one of the top models of Tannoy speakers – they all smiled profusely and nodded their approval. It seems the Chinese like the way Tannoy goes about making speakers. The experience certainly reinforced my impression that Tannoy has international appeal, but the real test would occur in my American listening room, not an audio store on the other side of the world. Could the dual concentric design appeal not only to Asian sentiment but also to American tastes? For this reason, in regards to cohesiveness of presentation, the Glenair strikes my ear similarly in manner to a planar speaker. The Dual Concentric® design is closer to that one sheet of Mylar in its uniformity, despite being the melding of a paper full range driver and horn tweeter. Just as there is a wall of sound with the planar design, there is a conical radiating core of sound with the concentric drivers. If readers ever get the chance to hear a larger Tannoy alongside conventional three- or four-way speakers, they will immediately notice the difference. The Glenair presentation is so uniform that, like a planar, its fluidity will make some decent speakers sound piecemeal, like a collection of drivers rather than a knitted fabric. The Tannoy’s another similarity to planars presents itself in the way the Glenair handles bass and treble. A real-world weakness of planar designs is the difficultly of creating low frequencies from limited driver real estate. Proportionately large drivers must be incorporated to achieve bass below 40 Hz. 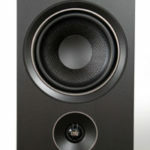 Similarly, the Glenair is not going to produce bombastic bass, despite the fact that it sports a 15” driver. Like a planar, the bass is not so much palpable as polite, accurate but not visceral. The top-end is spread more than a ribbon tweeter. 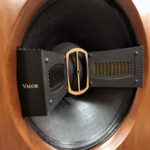 The proprietary Tulip Waveguide® (a structure reminiscent of a horn on a trumpet) splays out the high frequencies, giving an airiness to them but less localization than, say, the ring radiator tweeter in the Von Schweikert VR-4 SR MkII. This makes the Glenair easy on the ears when encountering poorly recorded material or artists with a predominantly edgy sound. Any treble-loaded material sounds far more relaxed through Tannoy’s Tulip-lipped tweeter than many more aggressive multi-way speakers. -A virtually full range driver (32 Hz – 1.1 kHz) introduces the potential of less definition at higher volumes and with dense program material. -Elimination of sonic clues indicating elevation of the source (i.e. singer’s voice and bass notes both rendered in same elevation). -Susceptibility to becoming congested or convoluted with inadequate electronics. Before tackling these distinct characteristics of the Tannoy Dual Concentric technology, a brief description of the speaker is in order. A classically beautiful specimen, the Glenair is a modern take on the traditional Tannoy speaker. Audiophiles who have been in the game long enough immediately know the Tannoy Prestige line has cabinets with yawning chasms housing their unified drivers. Cabinets with furniture grade quality with adornments make them at home in the finest of homes. Designed with higher sensitivity, even the largest of models can be driven by attractive, low-power tube amplification, thus making one’s stereo a statement piece. In a turn toward my personal preferences, the streamlined, more Scandinavian oriented cabinetry of the Glenair perfectly matches the simplicity of the 15” driver. One big, smooth cabinet, housing one, big, smooth driver – one smooth move in my opinion! The inner Birch cabinet is covered by solid American Cherry trim and veneer, and it complimented my listening room nicely. There is something dignified and reassuring about the simplicity of the Glenair, such that before being heard, one knows there will be well crafted sound emanating from them. My listening sessions were conducted solely with the grill removed, not only so that the large, smooth sounding driver could be appreciated, but that it would be unimpeded. The Glenair is certainly not a hollow box with a big driver. Substantial internal bracing is employed to “tune” the cabinet so that it is not dry sounding, nor overly resonant. With a slight arc to their face and a wide removable grill with woven fabric, the speaker resists the current trend of curving on the side toward its back. Rather, it holds straight, converging lines from front to back, so that as one beholds the trapezoidal cabinets they appear as three dimensional pie shapes truncated in the rear. The back side of the cabinet has two prodigious ports located midway up, and residing low to the floor sits the bi-wire terminal. A bulbous bunching of posts, the terminal looks inappropriate to the job and seems at first glance more suited for utilization as a naval mine! I was most impressed, however, at the ease with which I could slip spades onto the posts. The angles of each post seemed perfect to snug up even difficult to bend leads. By the time the review period finished, I felt Tannoy had created an ingenious solution for speaker connections. Being a European speaker, there is also built into the bi-wire terminal a “grounding post.” Tannoy has included this feature since speaker cables can pick up radio frequencies like an antenna. Grounding helps to eliminate the effect of potential intermodulation from these signals’ interaction with the amp. 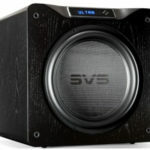 The Dual Concentric driver is the star of the show, and it’s also the most technically intricate element in the speaker. A mechanical overview of the driver shows no foam surround but rather a varnish impregnated woven fabric! This results in stiffness not achievable with rubber or foam. According to Tannoy, foam or rubber stores energy and can sound “slow” as a result. To aid in the lightness and speed of the full range driver, its cone is made of paper. The result is a large driver that has the action of a more diminutive driver. I like the logic employed here; capture the grandness of a big driver, but eliminate the shortcomings of materials which would make it ponderous. The hidden link between the two drivers is the single crossover set at 1.1kHz. Though a solitary crossover piece, according to Tannoy, it features, “vibration damped polypropylene capacitors,” along with, “air-cored and large laminated iron core inductors to avoid saturation effects distortion products.” Silver plated copper wire feeds the low frequency unit, while high purity copper supplies the high frequency driver. 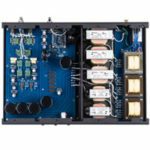 Nestled inside the throat, but not obstructing the larger driver, sits the “dynamic range compression unit,” or high frequency driver, and its “high frequency exponential horn” (named the Tulip Waveguide).” This assembly of tweeter and bell is mechanically fixed to the low driver. They are literally melded together while being separate entities. The key to success with this design is that the high frequency dome is set at the acoustic center of the low frequency, which lies behind the cone itself. The result is that the low and high frequencies are integrated at the source and disperse optimally in a 360 degree pattern following the contour of the Tulip Waveguide, along the surface of the low frequency driver, on into the room…and to infinity – or the room boundaries, whichever comes first! It is no wonder, then, that the sound is so smooth and seamless. I believe the twin Classic One MkIII would sound very smooth, utterly non-fatiguing, and tonally quite rich with the Gleaner. There would be a trade off for sheer resolution and dynamic impact as opposed to a powerful SS amp, but the ease of sound would be terrific. If you are a person not after the Nth degree of detail, I think you would find it a good combination.